Legos, we are a lego obsessed family right now, might as well use that “love” to our benefit. We have begun incorporating legos into our education. In addition to the Lego lapbook we made last week, I wanted to incorporate creative writing & so I challenged my son to come up with a story about LEGO MiniFigures. We started with a graphic organizer to help create a cohesive story. This story map was the format my son preferred, but look through the graphic organizers and see what works best for your child. After we organized his ideas, he dictated a very clever story to me. If your child is ready to write their own story, go for it! If your child needs to tell you their story, serve as their scribe as they weave their tale. We reviewed the plot together and made any necessary changes. We could have just put his story into our lapbook, but I am a huge fan of Shutterfly books, so I decided to turn his story into a project! 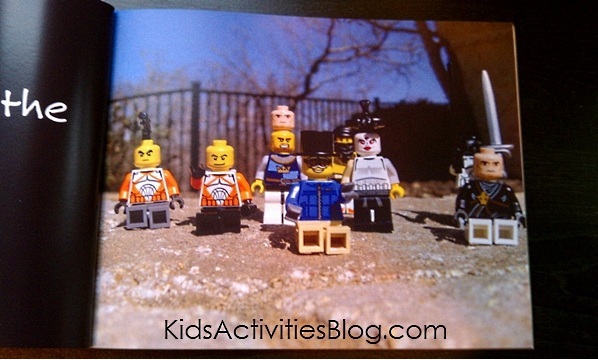 First, my son created his characters with LEGOs. We set them in a bowl so they didn’t get disturbed, and then he worked on his scenery pieces. On a sunny day, we went outside and he helped me place his characters in ways that corresponded with his story. We had such a good time figuring out how to pose our LEGO MiniFigures for different parts of the story. I didn’t have any “necessary” pictures in mind…I just followed my son’s lead and photographed whatever he asked me to. He had fun taking some photos too & we were excited to move to the next step. I later worked on putting his story into the online book template, but if your child is older they can easily do this themselves. After I had the entire story entered, we worked together to decide which pictures to put on each page. 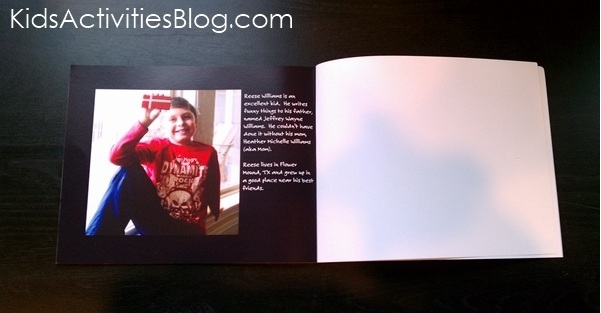 I was surprised my son had such firm ideas about which pictures should go on which page! Since I wasn’t taking pictures for specific pages, it was easy to fill our book because we had a nice, large folder of photos to choose from. 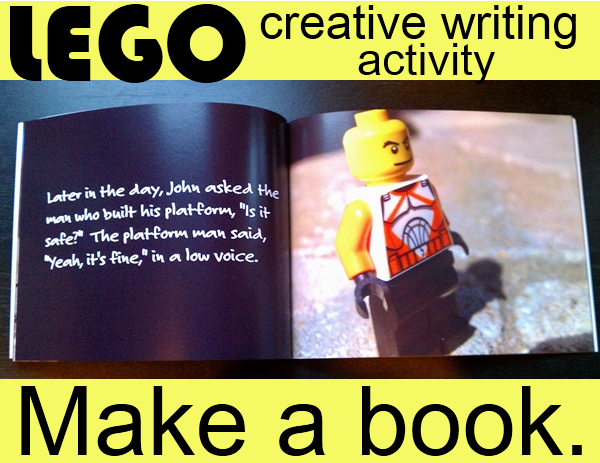 Make a homemade LEGO Instruction Book for even your youngest builders. Challenge older children to make a book for their younger sibling. What are you going to do with all those LEGOs when they’re not being used? Make your own LEGO table, of course! What a great idea! We do stop motion films with our legos (and other stuffed animal creations). But a book is a fantastic idea, thanks for sharing! Love. Love. Love this idea!!! Totally love it! I’m pinning this, will be sharing it with my blog’s Facebook followers, and adding it to our list of summer projects! Thank you for sharing this amazing idea!!! Aaah such a cute way to get kids writing stories! Love it! I LOVE this idea- and pinned it yesterday. I think I am going to have my 9 year old make one for his younger brother – I can’t wait. Thanks for the awesome awesome idea!!!! Love the idea! Kodak Gallery has been putting photo books on deep discount ever since I heard the website is up for sale. I think we’ll do this idea later this week. My kids will love it. I’m part of the Weekly Kid’s Co-op and mentioned your idea on my blog this week. So I was flicking made by you monday and it said lego….. I really think we’ll have to try this! thank you! I am so inspired! What a great idea and what a memory it would be! I’ve found you thru the weekly kids co-op. Thanks for sharing. Great ideas, I plan on taking one of our many huge tubs of LEGOs to school next year (so I can step on them in the classroom as well as at home), this would be great for story summaries, comprehension, creative writing… Thanks!